Haikal lost his debut last year at Aqueduct by a neck but has since won three in a row including the Gotham Stakes. He knows where the wire is, and for that reason, he’s our pick at a decent price to win this year’s Wood Memorial. Although he stalked a sizzling duel in the Gotham before rallying to win by a length, Haikal was five lengths back in early stretch before responded determinedly to get the job done. In his start previous to the Gotham, the Jimmy Winfield Stakes going seven furlongs, he rallied up the rail to win by a neck over fellow Wood Memorial entrant Joevia, after they tried to intimidate him in the stretch. There’s just something to like about this horse. He may not appear to be as talented as some in here, but he finds a way to win. Big test today, and a fun horse to cheer. 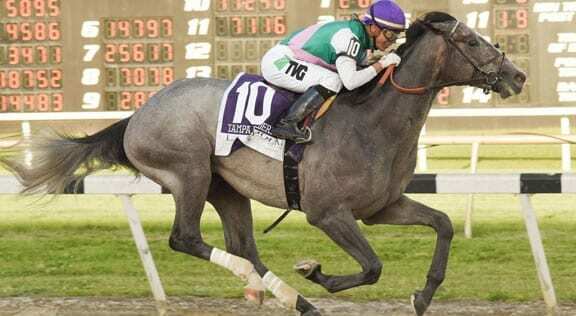 It seemed to take forever for Jose Ortiz to get Tacitus going in the Tampa Bay Derby-G2 on March 9 in his first start since November, but once he got him rolling between horses in late turn, he seemed to get into the race mentally. He took over from fellow Wood Memorial entrant Outshine at the sixteenth pole and defeated that one by 1 ¼-lengths while tiring late. Trained by Bill Mott, we expect Tacitus to be better this time as he makes his second start off the layoff. Tax stumbled at the start in Withers Stakes-G3 going the Wood Memorial distance of 1 1/8-miles in his last start at Aqueduct on February 2 and was also forced to steady mildly inside before taking over nearing the sixteenth pole and prevailing by a head in workmanlike fashion over fellow Wood Memorial entrant Not That Brady. He’s not flashy, but he should get a good trip stalking the speed in here, and he is proven at this distance. Outshine was making his second start off the layoff in the Tampa Bay Derby and had a clean trip tracking a fast pace from just back and outside before making his bid into the stretch. He’ll get top jockey John Velazquez back for this race, but we’re still thinking he should have been fitter than Tacitus in his last and should have beaten that one when it counted. Still, he’s trained by Todd Pletcher, who always seems to throw a wrench into our picks. The wild card in this year’s Wood Memorial is Final Jeopardy. He was under pressure up front in his most recent start going a mile at Gulfstream Park and drew away from the 4/5 favorite to win by 3 ¾-lengths. He’s going to be on or close to a pace that could include Haffa’s Union, Overdeliver, Not That Brady and Joevia, and we’ll now see what he’s made of. He did look good in his last and now steps way up in class while stretching out for hot trainer Jason Servis, who also saddles superfecta longshot Grumps Little Tots in here, Final Jeopardy should move forward, but will it be enough? Haikal the heat-seeker to win.